Lilabelle Lane: Universe ...... STOP IT! OMG this weekend has been in the diary since September last year and now it is here. I've never been before and I don't think at this stage I can fully comprehend how big it is going to be. There are plans to catch up with some old and some new friends for coffee here. But do you know what I am really looking forward to? At the Novotel in Glen Waverley. Two full days of stitching fun. The designers are Natalie Lymer, Gail Pan and Leanne Beasley. Can't wait to see what they have been designing for us. It is also going to be a great weekend of catching up with new and old friends, all made through the wonderful world of Blogging and Instagram. So Shez, is that bag of yours packed? Good luck on your adventure. I am sure that Glenn can manage and if he can't, he'll learn. Go and keep our economy afloat. Hoping to get to the show on Sunday, so leave something for us. It should be an amazing time! Enjoy! I look forward to updates on your return. Bet those Tim Tams won't last long! 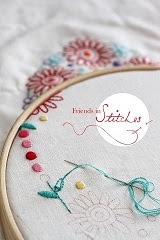 Have a great time with your lovely stitching adventures, girls. Hope you two have the best time ever. Have a great time.....I've just returned from fqrlondon and I'm sure you will be buzzing. Lucky girl....I'm sure everything at home will be fine...have a fantastic time. Have a lovely time Sharon the kids will be fine with Glenn.